The energies of love exist full-blown within each human being. We have an incredible power, given to us at birth, that we must learn how to handle, and it is this power that has gotten the world into the state it is in. William Blake tells us "the road of excess leads to the palace of wisdom".� June Singer understands this to mean that when we go too far in one direction, we inevitably come to the place where we see our own folly laid out before us, and from this we learn there must be a better way. We experience love: first, of parent and child; then romantic love (or lust); then Platonic love--the love of friend for friend; and love for country, for land, for that which is familiar. Or the god-intoxicated love of mystics and saints, and those who have known near-death, or god, or real compassion. 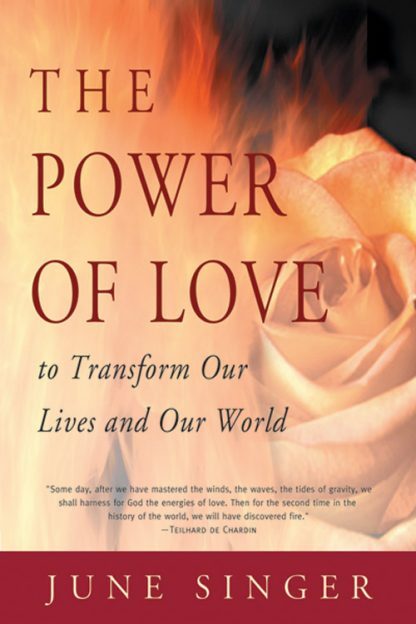 June Singer draws on her Jungian background to explain our contemporary confusion about the power of love and our love of power. She says that when we understand our relationships and our changing world, we can develop the masculine and feminine sides of ourselves. This means that we are free to assume the power that is given when the ego is developed, so that no other person has to act out parts of ourselves in order for that part to be expressed. When we reach the transpersonal stage of love, we are able to see life. We no longer see power as a magic wand to gain superiority over others. We begin to understand what it means to say "we are all one". Transpersonal love fires humanity. It takes us beyond ego, beyond personal needs, and unites the personal ego with the larger self. When the various inner parts of ourselves are in harmony, we can truly love--and we can begin to affirm the union between human and divine.